Do you want to use some cool iOS apps that require you to jailbreak your iPhone, iPad or iPod Touch in order to install them? If so, you might want to consider reading this before you go ahead and jailbreak your iOS device. Jailbroken iOS devices have more customization options and features compared to jailed ones. But they also have their own share of disadvantages. By jailbreaking your iOS device, you might void its warranty and lose official support from Apple. Also, installing official iOS updates from Apple automatically restores the device to non-jailbroken state. And hence, jailbroken apps will no longer work on your iPhone or iPad. Additionally, jailbreaking an iOS device might put its security at risk. Jailbroken apps basically fall into two categories. Some of these apps don’t require system-level access permissions in order to operate. For example, Torrent clients, system-wide screen recording apps, NES emulators, etc. can function normally without any special permissions. On the other hand, some apps usually provide features that require system-level access (for example, modifying the look and feel of iOS, locking apps with custom password, etc.). If the apps you want to install fall in the second category, this article won’t be helpful to you. But if your apps fall in the first category, we have solutions that will allow you to install such apps on your iPhone, iPad or iPod Touch without jailbreaking the device. 1.3 Are these services legal? Usually, non-jailbroken iOS devices only support app installations from the App Store. But Apple officially allows developers and organizations to distribute their own apps Over-The-Air (OTA). Apple implements two different methods for distributing apps Over-The-Air. In-house app distribution: Organizations enrolled in the iOS Developer Enterprise Program are allowed to build and distribute in-house apps for employees. App distribution for Beta testing: Developers may also choose to distribute apps Over-The-Air to select users for Beta testing. By implementing these OTA app distribution methods, some services have been launched that allow users to install apps outside the App Store on non-jailbroken iOS devices. These App Store alternatives are available both as free and paid services. You might like to try out the free alternatives to install jailbroken apps on non-jailbroken iOS devices. Services like iEmulators, iNoCydia or Emu4iOS allow you to install apps like iRec, AirFloat, iTransmission, BarMagnet, GBA4iOS, iDOS, RecordScreen, Shou, etc. on your iPhone and iPad without jailbreaking it. But such free services often face certification issues with Apple’s latest system patches. So most of the apps available on these free alternative app stores may not work as expected from time to time. In order to install such apps, you might need to change the system date on your iOS device. For a more reliable service for installing jailbroken apps on non-jailbroken devices, we recommend you to use paid services like BuildStore. BuildStore offers a stable solution for installing apps from outside the App Store, on non-jailbroken iOS devices. To maintain the stability of apps and avoid certification errors, the service charges you a subscription fee of $9.99/year per iDevice. Once you pay for your yearly subscription, you can download and and install all BuildStore apps for free. As for app updates, BuildStore tightly collaborate with app developers to publish app updates. If any app is updated, BuildStore announces it on Twitter. So you need to follow BuildStore to keep up with their latest updates. BuildStore also accepts requests for new apps that are not available on their app store yet. And if in case you run into any issues, BuildStore has a support team to help you resolve them. BuildStore’s content policy ensures that apps published on BuildStore are free from malicious code and that it doesn’t harm the users or their devices in any way. So, you can safely install BuildStore apps on your registered iOS device. 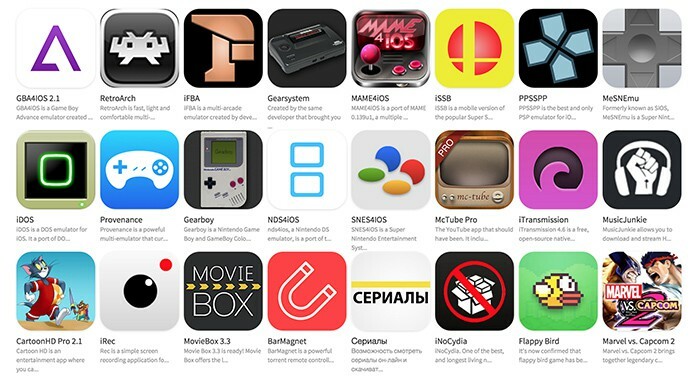 Currently, the following apps are available on the BuildStore that can be installed on any non-jailbroken iOS device. All these apps are available as free downloads once you become a BuildStore subscriber. The services mentioned in this article use legal ways to install apps, as they implement Apple’s official OTA app distribution program. However, these third party app stores feature some apps that might be used to perform illegal activities, but are legal by themselves. For example, torrent clients are legal software, but one may use it for downloading illegal content. On the other hand, some apps may directly be promoting illegal activities in some way or another. For example, BuildStore contains apps like MovieBox (allows you to download HD quality movies) and MusicJunkie (allows you to download high quality music), which let you download paid media content for free. Services like BuildStore remove the restriction of downloading apps from outside the App Store, without requiring you to jailbreak your iOS device. Most of these apps are usually not allowed in the App Store because they may be harmful or may be used for illegal activities. BuildStore has you covered for device and user safety. But it is completely your responsibility to decide which apps you want to install and how you want to use them. Disclaimer: 7labs does not promote content piracy or any other type of illegal activity, and is not responsible for any misuse of the information provided in this article.